We're very excited to announce that Hisham Almiraat has joined Global Voices Advocacy as Director. 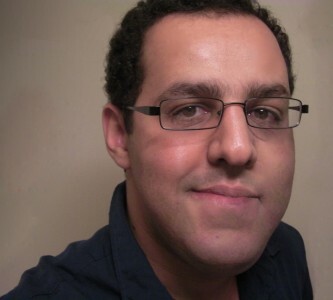 Hisham is a long-time member of the Global Voices community. He writes about Morocco, North Africa and online freedom of speech. He's also an award-winning blogger and writer. He won Deutsche Welle's Best of Blogs competition for his co-authored blog TalkMorocco.net in 2010. He then co-founded Mamfakinch, which has recently won the Breaking Borders award in support of online freedom of expression from Google and Global Voices. He also blogs on the Mirror| المرآة and is on Twitter at @__Hisham. Additionally, Hisham is a medical doctor, and with practices both in France and in Morocco. Hisham joins Global Voices Advocacy at an important time, both for online freedom of speech and for the Global Voices community. The last several years have demonstrated that online speech can have consequences in the real world: online social movements, digital activism, digital-only journalism, and a flood of content in writing, audio and video have had a major impact on political and social change in numerous countries. This is especially true in the Middle East and North Africa. Hisham's personal experience in working within digital movements in Morocco, and his participation in extensive networks of learning and practice in digital activism in MENA and around the world will be a welcome force for Global Voices’ advocacy work. Many governments around the world, recognizing the power of online speech, are moving to bring it under the control of national law, in the process applying media restrictions, restricting access, increasing surveillance, often making the online media as hazardous and contested a space as other forms of media. For the past several years, individuals working in citizen media have been frequent targets of attack, violence and arrest, as documented by Global Voices Advocacy, as well as journalist rights organizations such as the Committee to Protect Journalists and Reporters sans frontières. The GVA project Threatened Voices has documented 333 cases of citizen media producers threatened, attacked or arrested in the past three years. Given this, GVA's work has a new urgency: to document and spread awareness of threats to online speech, to help digital activists and citizen media producers to be aware of the risks and threats that come with some kinds of speech, and to learn the tools and practices that will help them to protect themselves. GVA's ultimate purpose is to build networks of support and trust so that we all have the communities we need to defend our rights to speech. Our work under our first director, Sami Ben Gharbia, aimed to ensure that online citizen speech received the same protections as the work of journalists and professional media producers. Initially, that work was focused mostly on documenting attacks and threats. While documentation is still vital, we also recognize that policies set by governments, by the private companies that control a great deal of online speech, and by internet governance bodies will have a major impact on our ability to retain a global, unified internet. Individual cases and work on policy now go hand in hand. Given the challenges before us, Hisham's mix of experience, passion, calm wisdom, and strategic thinking should serve GVA well. I'm personally very much looking forward to working with and learning from him, and welcome him in his new role.